I've already gone on record with my initial thoughts regarding the upcoming hockey comedy "Goon" (summation: Outdated view of the game, Liev Schreiber is cool), so there's no need to get back into it. However, now that the first full theatrical trailer has hit, I can say that my initial impressions seem to be pretty right on, but I must give them major kudos for the trailer's money shot - because it's not only cool, but it will boldly fly over the heads of 90% of the audience. That takes guts. The goalie's putting on his pads wrong! Would you baseball fans brush it off if Willie Mays Hayes made his "basket catch " while wearing a catcher's mitt? Why not? "Major League" is a comedy, isn't it? Has his right pad on backwards. See? Those side pads go on the outside. OK, OK....I've nitpicked enough (and, yes, I'm mostly joking. Settle down). Now to the kudos. 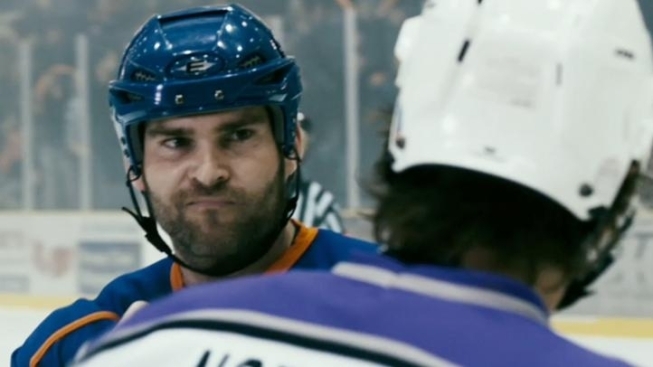 The trailer ends with Seann William Scott's character starting a fight with former NHL tough guy George Laraque. That's gag #1. Yeah. Well played, "Goon." Maybe a handful of Canadians will get that. Let's see if that and Schreiber's mustache are enough to win us over.